Their hard, rounded and smooth appearance creates an effective camouflage amongst the quartz stone fields where they are found. These white quartz fields or ‘Knersvlakte’, are ideal habitats for many of Namaqualand’s dwarf succulents, as the quartz reflects sunlight and therefore creates a much cooler microclimate compared to the adjacent patches of darker sands and dolerite rocks. In autumn, Conophytum calculus displays its colourful side and from the ‘button hole’ emerges a small yellow-orange flower. To experience the fully opened bloom however, a night visit is required, as these heavily scented flowers are nocturnal to attract moth pollinators. Namaqualand is a large area extending along the west coast of Namibia and South Africa. Unbecoming of deserts, Namaqualand experiences reliable and widespread gentle winter rains which has allowed for the incredible and unparalleled diversity of miniature succulents and beautiful bulbs. Sadly though, this area has been heavily exploited for its mineral wealth. More than 65% of the Namaqua coastline has been mined and large tracks of the Knersvlakte where Conophytum calculus occurs have also been stripped for gypsum. Making a gift of the button plant seed adoption will safegaurd its future in the Millennium Seed Bank. Leucanthemum vulgare is a familiar and attractive grassland plant, growing up 91 cm tall. It is a member of the daisy (Compositae/Asteraceae) family and is visited by many insect pollinators. 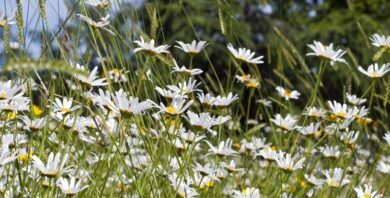 Adopt an oxeye daisy seed for her as a gift and ensure its long-term survival in the Millennium Seed Bank.